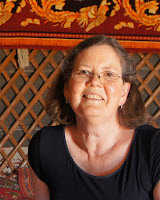 Dr Jean Mulder, who travelled with Uzbek Journeys in 2012, is a senior lecturer in the School of Languages and Linguistics at the University of Melbourne. Here she describes her homestay experience in the Uzbek village of Sentyab. Sentyab, where people have lived for more than 2,000 years, is nestled in a fertile green river valley of the Nuratau Mountains, which run for about 180 kms east-west across central Uzbekistan. The homes in Sentyab are constructed out of local rock and are surrounded by gardens with big old fruit and nut trees that have been cultivated for centuries. Small channels have been constructed off the central river so that the gardens and neighbouring rock walled grazing areas are all stream fed. With only a few greetings in common, we were made to feel welcome as we shared a smile and wandered. As part of a community-based eco-tourism initiative launched in 2007, three families in Sentyab have converted part of their homes for visitors. The guesthouses are named in honour of the wife and we stayed at Maysara’s Guesthouse, where Maysara Bozorova and her husband, Momin, along with their younger daughter, Mohina, were our hosts. Like most of the households in Sentyab, they grow vegetables, keep livestock (sheep, cows, goats) and poultry, and produce their own eggs, meat, butter, yogurt and other milk products. A spring provides lovely, cold drinking water. We slept in a bedroom furnished with kurpacha (mattresses) and for amenities there is an ablution block with a flush toilet and a solar-heated shower as well as an outdoor hand washing basin. On our first afternoon we slowed down with chai (green tea) on the tapchan (a raised platform that is used in Central Asia for relaxing and reclining outdoors). I thought it would then be a good time to work on winding the silk skeins which I had purchased a few days earlier from the women at the Oblakoulov family’s ceramic workshop in Urgut, into balls for knitting. Halim-aka, our driver, Vicki, my travelling companion, and Maysara all finished up helping me untangle the worst bits. Later, after dinner in the roofed supa (verandah), one of my best memories is conversing with Maysara via translation pages she had and a Lonely Planet phrasebook we had. After working through standard topics such as family members, children, occupations, types of livestock on our respective farms, we ended up having to call over Javlon, our translator, from the men’s group on the tapchan, to translate from English into Uzbek for Mohina, who then translated from Uzbek into Tajik for her mother. While circuitous, we wound up learning about how Momin wooed Maysara, which included building her a house. On our second day, with Momin as our guide, we set off on a 5-hour walk to visit a lake higher up in the mountains. We followed the central river up through the valley climbing steeply past ever remoter homes, a marked sacred site, a traditional water-mill and several waterfalls, reaching an area with many ancient Arabic inscriptions carved into the rock cliffs. Thinking that it would be a good time to taste some of the picnic that Maysara and Mohina had sent along, Momin directed us back along the trail to a homestead up a side valley. After enjoying hot tea and our picnic on our host’s tapchan, we ended up helping her husk walnuts and never quite resumed our trip to the lake. While there is electricity in Sentyab, the closest phone reception, and then only intermittently with one of Uzbekistan’s service providers, is a 15-minute scramble up the side of a mountain. Whether or not you actually want reception, from this vantage point, which we named the Telephone Booth, there are stunning views of the village, the valley and the surrounding mountains. Listening to the last call for prayers, watching the sun leave the valley, talking about life with Javlon, I can think of no better spot to chill at the end of the day. While Sentyab may be a long way to go for a digital detox, when combined with a trip to Lake Aidarkul or a stop off in Nurata to see the trout at Chashma spring beneath the remains of Nur fortress built in the 4th century BC by Alexander the Great, it is a great chance to experience the hospitality of rural Uzbekistan. Note: On an Uzbek Journeys tour, Sentyab is not included. However, you can certainly make it an optional excursion before or after the tour.